What is history and what is legend? There are plenty of both at Glastonbury. Ancient tradition tells tales of the Isle of Avalon, the place of the dead. Glastonbury has always been associated with this mythical place and it was certainly once a sacred burial ground, followed later by a druidical college. Avalon is often associated with the Arthurian legends, so Glastonbury has long been linked with King Arthur and his Knights of the Round Table. Some legends even claim that the Holy Grail was buried here, so pagan and Christian beliefs go hand in hand. Other legends tell of the arrival of Joseph of Arimathea after the crucifixion of Jesus. The story goes that Joseph, who had been a wealthy merchant and traveller prior to his days as a missionary, came to a spot in Glastonbury known as Weary All. He was given some land there and planted his staff to stake his claim. The staff was transformed into a thorn tree. The huge flowering tree survived the Reformation, in spite of attempts to destroy it because of the supposed magical connections. Eventually it died, but only after several trees had been budded from it. Today, there are three thorn trees known to have survived in Glastonbury. One is in Glastonbury Abbey grounds, another in the churchyard of St John’s Church and the last in the garden of the vicarage. The tree is believed to be a Levantine thorn, which flowers in May and at Christmas. 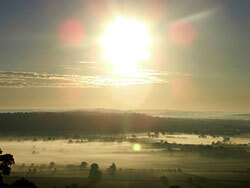 Glastonbury Tor and some of the surrounding land was once an island, joined to the mainland by a narrow peninsular. The island was surrounded by tidal marshes which gave good natural protection. This is a little reminiscent of the Isle of Ely in the fens on the opposite side of England. Although there were people living in Iron Age lake villages near the island in Neolithic times, the island appears to have been uninhabited and treated as sacred place from the beginning. 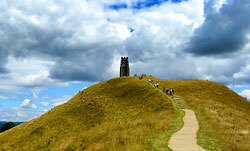 In the Middle Ages Glastonbury emerged as a centre of pilgrimage. This was partially connected with the ancient tradition of the Isle of Avalon as a sacred site but also because of the great Benedictine Abbey that now dominated the town. The monks led a busy life of writing and illuminating manuscripts, teaching, caring for the sick and the poor and, of course, looking after the many visiting pilgrims. They also had to manage the land and farms - all this in addition to praying. 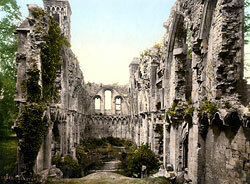 As a consequence of all this industry and the number of visitors, a thriving town had grown up to support the abbey. Glastonbury is very well documented. There are more than ninety Saxon charters relating to the town, dating from the 7th century onwards. In addition, there is a great deal of material relating to the later medieval period and afterwards. De Antiquitate Ecclesiae Glastonie, which was written in the early 12th century by William of Malmesbury, is a valuable historical source. Glastonbury is set in lovely countryside and there are plenty of walks, including some to the top of Glastonbury Tor, which offers great views of both the Mendip and the Blackdown hills and the nearby city of Wells. Other less strenuous walks are centred on the town itself, which has some interesting old buildings and structures such as the 18th century Pump House. Another walk is along the ancient Druid pathway, newly replanted with oaks to supplement the ancient trees, Gog and Magog. 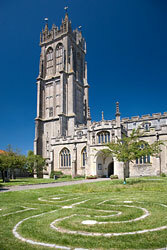 St John's was one of seven local churches over which the Abbey of Glastonbury originally claimed complete ecclesiastical jurisdiction. After the dissolution of the Abbey, the church passed to the Crown, and eventually to the Bishop of Bath and Wells, who is now patron of the living. St. Benedict’s Church was originally a chapel of St. John’s, only becoming a separate parish much later. 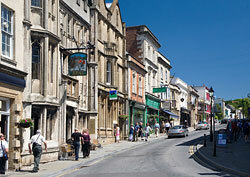 Glastonbury today is an interesting town with several museums and other attractions. There is a wide variety of cafés and restaurants and plenty of accommodation for visitors to the area. Some of the old buildings are really interesting – notably the Tribunal, a 14th century town house which was possibly once some sort of commercial building. The George and pilgrims has a mediaeval façade and the old Courthouse is worth a second glance too. Of course there is plenty to occupy the visitor to the area and lots of other interesting places and holiday resorts within easy reach of the town. Every year (except this year) the Glastonbury Festival is held at Worthy Farm, nearby in Pilton.